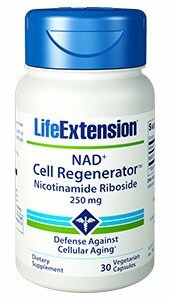 NAD+ Cell Regenerator® promotes systemic youthful functions and boosts healthy cellular metabolism with a clinically studied dose of NIAGEN® nicotinamide riboside, a patented compound that helps inhibit the age-related decline in NAD+, a coenzyme critical to healthy cellular metabolism. If you are experiencing general fatigue and lack of motivation, it may be due to the age-related decline in NAD+ levels. NAD+ is found in every cell in your body, where it facilitates youthful, healthy cellular energy metabolism and other systemic youthful functions. NIAGEN® nicotinamide riboside increases cellular levels of NAD+, a coenzyme critical to healthy cellular energy production. This unique coenzyme is necessary to create adenosine triphosphate (ATP) the compound your body uses for fuel. In a randomized controlled trial published in 2017, older adults taking a daily dose of a formula that contained 250 mg of nicotinamide riboside led to a 40% increase in NAD+ levels after just 30 days. Evidence from preclinical studies indicates that increasing NAD+ also encourages healthy metabolic and cognitive function. NAD+ Cell Regenerator® also promotes the activity of sirtuin (SIRT1 and SIRT3), essential proteins that work with NAD+ to promote healthy aging. It also enhances production and function of mitochondria the cellular powerhouses that provide the energy you need to thrive. DIRECTIONS: Take one (1) capsule daily with or without food, or as recommended by a healthcare practitioner. Information provided by Life Extension Foundation. Other Ingredients: microcrystalline cellulose, vegetable cellulose (capsule), silica, vegetable stearate. For more guidance on how to use nutritional supplementation, go to Dr Slagle's individual website.